It's not surprising that Michigan is a great destination for seafood. Why wouldn't it be? After all, we're literally surrounded by water on three sides, and there are so many lakes and rivers within the state that finding fish isn't exactly a challenge. From buffets to upscale plates, Michigan’s great seafood eateries are serving up extraordinarily fresh fare. Here are our 10 favorite seafood restaurants in the state! A personal favorite of mine, Colon's River Lake Inn will feature a staggering variety of seafood dishes, despite the fact that it's several hundred miles from the nearest ocean. From lobster tail to snow crab legs, shrimp, orange roughy and whitefish along with the catch of the day, there's always something exciting here. Show up on Friday and Saturday nights for the Land & Sea Buffet, an all-you-can-eat option packed with seafood options including a wonderful bacon-wrapped scallop. Mackinaw City is home to the Keyhole Bar & Grill. In fact, the Keyhole won the “Top Seafood Dive” award from Coastal Living magazine, which cited the Keyhole's fried whitefish—a Michigan staple—and the “beer or whiskey attitude” that precluded both fancy cocktails and pretention. Easily one of the best seafood places in all of Michigan, Detroit's Joe Muer Seafood represents some of the most upscale seafood dining around. Start with the raw and sushi bar for lunch and move on from there to Oysters Rockefeller, Shrimp Ilene, and deviled crab balls. That's just the appetizer and lunch run—it only carries on from there to crab-stuffed flounder, broiled whitefish, salmon and more. A variety of sides, and even some non-seafood dishes from steak to meatloaf round out the package. Grand Rapids' Leo's Restaurant is well known in the area for its seafood options. Start with the fresh catch specials covering everything from Lake Superior whitefish to Costa Rican mahi mahi and the result is a seafood experience few others can match. Then add in the other seafood dishes like sea scallops, live Maine lobster and more, along with non-seafood dishes, and the experience is complete. At least, it will be once you get the dessert menu up and running, featuring the German chocolate cheesecake, among others. Another leading pick from Coastal Living, Dockers Fish House is more of an upscale option, but it’s not stuffy. The restaurant bills itself as featuring “sandal-wearing dining all day,” and is located near the marina for those who have a fondness for boating, or just own a boat themselves. Whitefish, lake perch, crab cakes and more are all on hand, including the 1.5-pound snow crab legs option and the macaroni and cheese, which features both lobster and crab. By day, the Schnitz Ada Grill in Ada is a full-service deli that makes a pretty impressive lunch. At night, however, it puts on its good suit and becomes a casual fine dining affair that's well received. 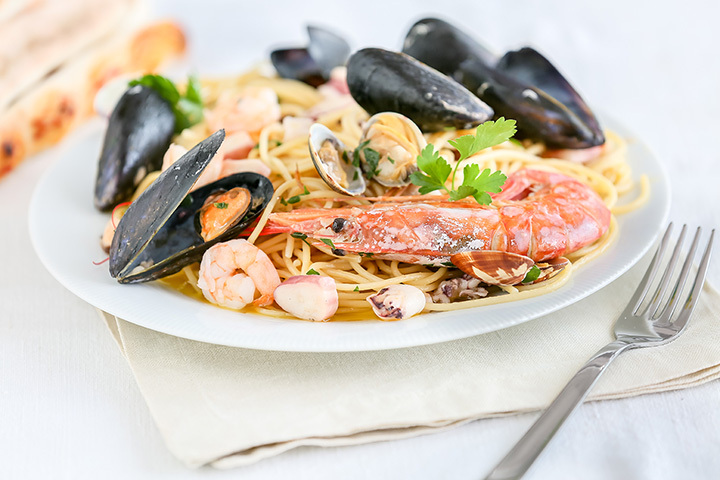 Start with the fresh mussels and head up to the walleye, perch, salmon or tuna to make a complete seafood dish. Naturally, there will be plenty of other options on hand, for those just traveling with seafood buffs, and house-made dessert will round out the experience well. Bortell's Landing in Ludington is a true gem. This home of hot fried fish—part of the Bortell's Fisheries operation—has been around on one level or another for the last hundred years, reports suggest. Fish, shrimp, scallop and more are all on hand, and when you throw in a great view of Lake Michigan, you'll end up with a package that will impress just about anyone. In Grand Haven, in the lobby of the Grand Theater, you'll find the Grand Seafood and Oyster Bar. It's the first sushi bar in Grand Haven, but there's more than that afoot here. Dinner specials of all types are routinely found here, and seafood from mahi mahi to wild salmon will also be in play. Consider the Seafood Etouffee or the lobster mac and cheese for a little something different, and with wine and local beer on tap, the complete experience is waiting for you. In Paradise, there's a fish restaurant that will make you think the name is literal: Brown Fisheries Fish House. Serving up the day's catch—as in pulled that day from Lake Superior—there's most everything here from whitefish to trout. Then, they'll even mix up the preparations. You want grilled filet? No problem. How about fried or broiled? Can do. Feeling in the mood for trout chowder? Not a problem. So for some of Michigan's best fish done a variety of ways, you'll find it at the Brown Fisheries Fish House. Start yourself out by enjoying a magnificent lake view, and then segue into some unbelievable fish options. Oysters from both Atlantic and Pacific catches are on hand, along with sea scallops, crab cakes, whitefish and more, and that's just the appetizer course. Whitefish and salmon are on here, and for an occasional bit of waterfowl—particularly the duck—there's a lot to choose from here.